Country road, take me home….. The task that I was dreading today passed by without incident thankfully. I picked the RV up this morning and took to the interstate roads of California. This was my first ever time driving an RV, not to mention driving in the USA. "It was all good" though as they say over here. Richard (aka Neil) will be taking over driving responsibilities tomorrow when finally I get to start the 3100 mile run across the USA. On Sunday at 09:00 Pacific Time (17:00 BST), you'll be able to hear coverage of the start of the run across the USA on LA's biggest talk radio station; KFI AM 640. You can listen online here: www.kfiam640.com. 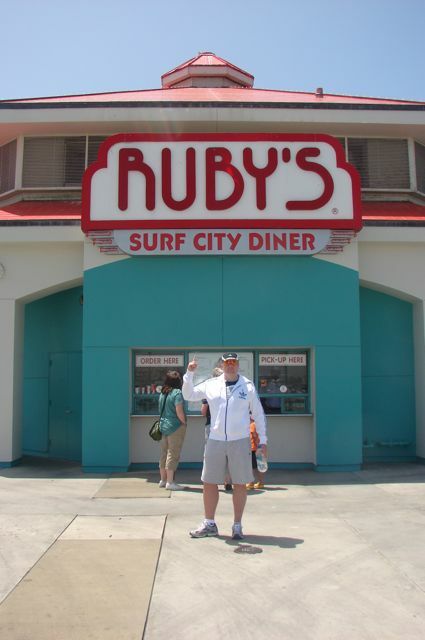 The team and I did a "reccy" down at Ruby's Diner this morning. And while we were down there, we thought it would be rude not to try the local delicacies (again!). That makes up for the 2 salads I had yesterday! Ruby's Diner and the pier on which it is situated is a really nice place. 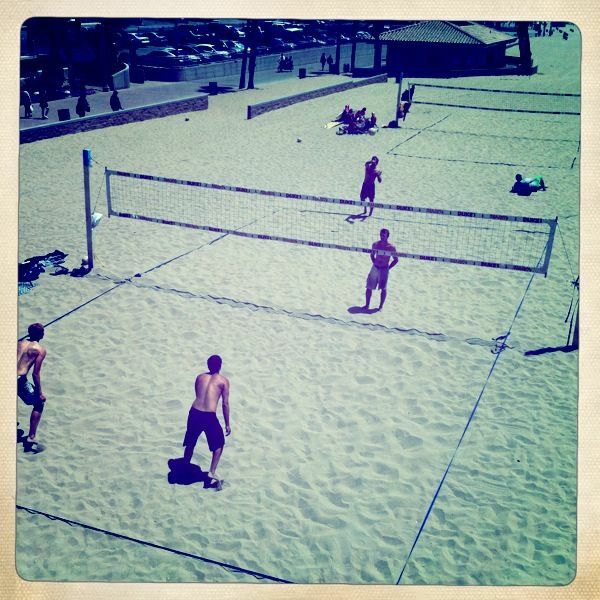 There was a lot of surfing and fishing going on and almost every beach volleyball court was occupied. There was also a farmer's market and I took the opportunity to buy some strawberries and blueberries. They were about 1/5 price of the UK and absolutely delicious. It's a busy day tomorrow (or today if you're reading this in the UK). 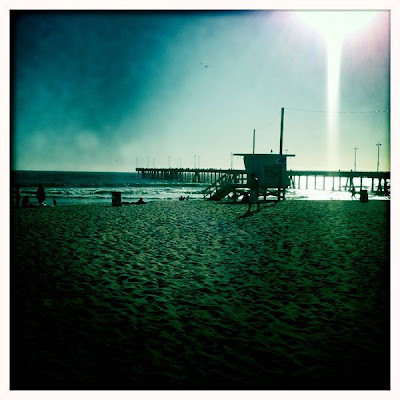 The team and I leave the digs in Huntington Beach and will be picking the RV up in the morning. I have the unenviable task of driving the RV to the first spot near the start line in Huntington Beach where we will remain until Sunday. PR Lady Shelli will be picking Richard, the first driver, up later in the day. Thankfully, Richard will be driving after that. I'm really not looking forward to driving a 31 ft vehicle on the roads of LA. What can go wrong! 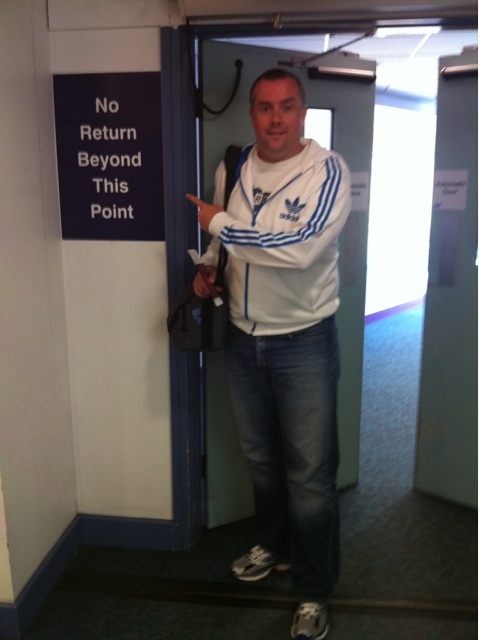 I can't sign off today without saying a huge thank you to exiled Geordie, Nick Davison (pictured above). He took me and the team out for dinner tonight in Huntington Beach and later on we got to meet his lovely family and friends (including Big Rick who is pictured in a previous Blog Post). Nick, a former PE teacher at Wallsend and later Shiremoor Middle School, has been in the USA for 20 years. I'm pleased to report that his Geordie accent seems quite well intact. 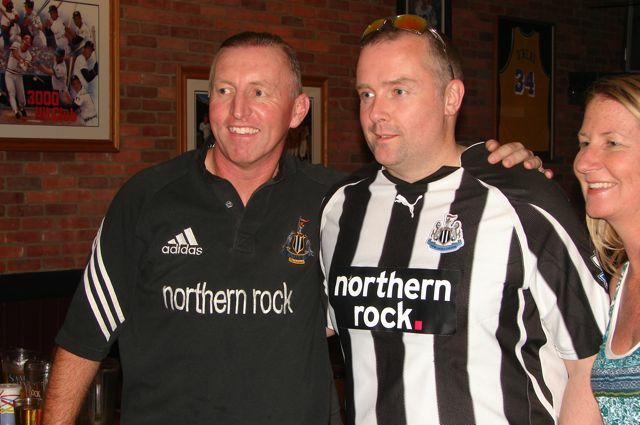 Nick got in touch a few weeks ago after seeing the run across the USA publicised on nufc.com. Thanks Nick. I awoke this morning to the news that the charity fund for St Benedict's Hospice and The Children's Foundation had passed through the £30,000 barrier. That's now also over 50,000 US dollars too! A lot of donations have been made this week and nice messages left with them on the 2 justgiving.com pages. Thanks go to David Fairlamb Fitness, George Caulkin, Alison Hudson, Paul Stewart and Paul Venn for very generous donations. Thanks also to the numerous other kind folk who have made a donation. Both myself and the 2 charities really appreciate your donations no matter how large or small. Especially in tough economic times such as these. I'm very keen indeed to get the run across the USA underway on Sunday. This will give me the opportunity to finally start earning all of those generous pledges that have been made. I should point out that of the £30,080 of pledges made to the charities, a massive £27,397 has already been given via justgiving.com or direct via cheque. The remaining £2,683 is in the form of what I like to call "traditional sponsorship". This is where a person agrees to pay the charities upon successful completion of the run across the USA. So there's another reason why I'm keen to get the run underway and to finally begin to make it a success. If you would like to make a donation then any amount, no matter how large or small, would be gratefully received using the following links. With only 2 full days left before the run across the USA starts, it's super brilliant (as they might say over here in the USA) that the charity fund stands so close to £30,000. At the time of writing, the current total is £29,996.37. That's only £3.63 away from that magical £30,000 mark. Please don't forget that any donations, no matter how large or small, would be gratefully received using the following links. The Journal - "Now and Then"
Here is a link to a "Now and Then" piece that I wrote for The Journal. It was in last Saturday's newspaper. Please click here. There was no sign of jet lag when I woke up this morning, thankfully. 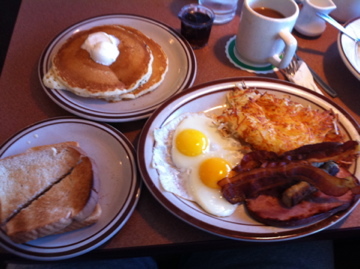 After a quick call home (there is an 8 hour time difference) PR Lady Shelli, Publisher Stu and myself went to Dennys for breakfast. And what a breakfast it was! Today's plan was mostly about getting supplies for the run ahead; energy bars, gels, Body Glide and a pre paid broadband dongle for use over the coming months. Oh and some porridge too, which will save me from eating one of those huge breakfasts again. The hotel room where I'm staying has a small kitchen in it so I'll be able to make my own breakfast for the next few days. And, of course, the RV has kitchen facilities so temptation shouldn't come my way again. After the shopping trip, there was time for a little sightseeing. We headed up to Venice Beach in gloriously sunny conditions. 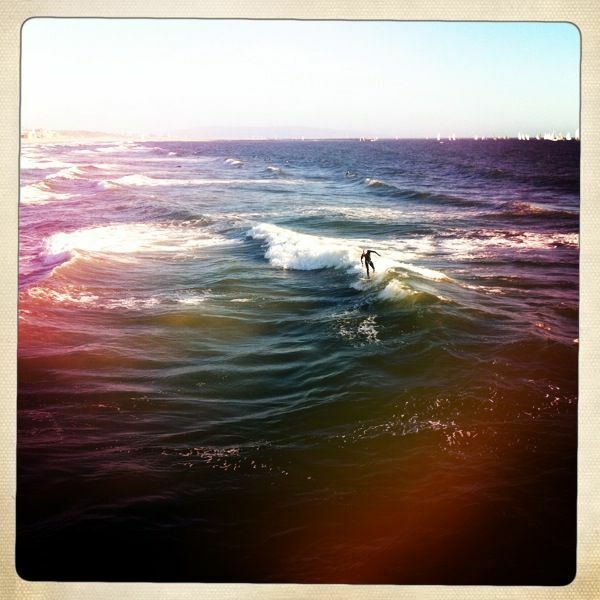 People were surfing, fishing, canoodling and generally having a really good time. It was a really nice place to visit. However, if I'm being honest, I'm far too eager to get the run across the USA underway to really get the maximum enjoyment out of my time in LA. After planning this run for 3 years, May 1st can't come quick enough. It seems that great minds think alike, as my Son Jack wrote on his blog "Hope you are having a good time. Don't forget your not on holiday you are on a mission :-) Proud of you Dad .". That sums it up perfectly in my opinion. 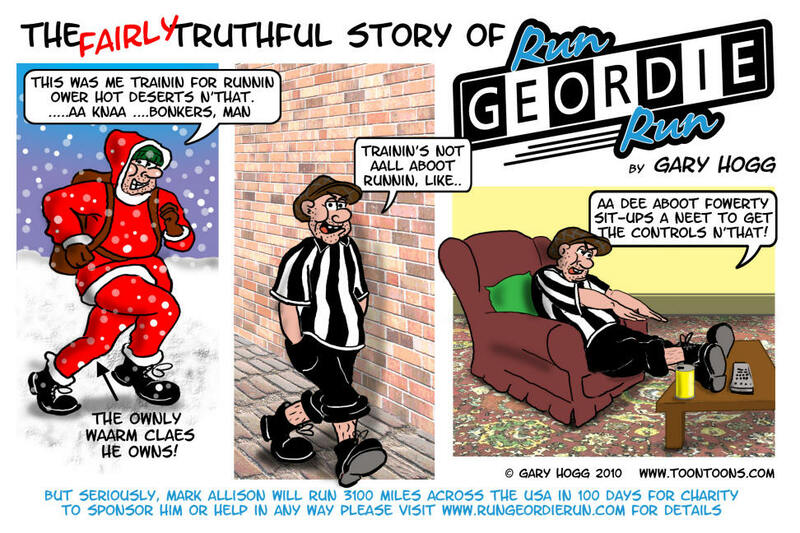 Incidentally, Jack's blog can be viewed at www.rungeordierunjunior.blogspot.com. It was set up as an easy way for us to keep me updated and more importantly to help keep morale up. One other thing that has helped keep morale up is the amount of donations over the last few days. The charity fund currently stands at £29,711.54. It would be amazing to start the run across the USA with over £30,000 of donations. Thanks to those kind folk who made a donation and left a message on the justgiving sites today. Thanks also to everyone for their messages of support on Twitter, email and Facebook. Please don't forget that any donations, no matter how large or small, would be gratefully received using the following links. Run Geordie Run and a Lifeguard on Venice Beach, LA. After a nice relaxing British Airways flight to LA, I'm finally in my hotel room in Huntington Beach at 22:00 local time. By my calculations that's 06:00 BST. It's been a long day! Thank you to my Stateside PR lady, Shelli Mayfield for picking me up at the airport. Shelli is going all out to make sure that the run is a success and not only myself but all of the Support Team are taken care of when they get to the USA. As soon as I got off the plane, Shelli handed me a US phone and I was able to make contact with my family back in the UK. Regular readers may remember that Shelli has volunteered her services and is currently studying for a PR Degreee at North Carolina State University. Her local knowledge and guidance has proved to be invaluable so far. Long may that continue! I've said it many, many times and will continue to do so no doubt. Peoples generosity never ceases to amaze me. So thanks to everyone who made a donation today. The current total for the 2 charities is £29,406.37 which is quite fantastic. I'll sign off now from a canny little hotel in Huntington Beach. Goodnight ya'll…..zzzzzzzz……. Any donations would be gratefully received using these links. 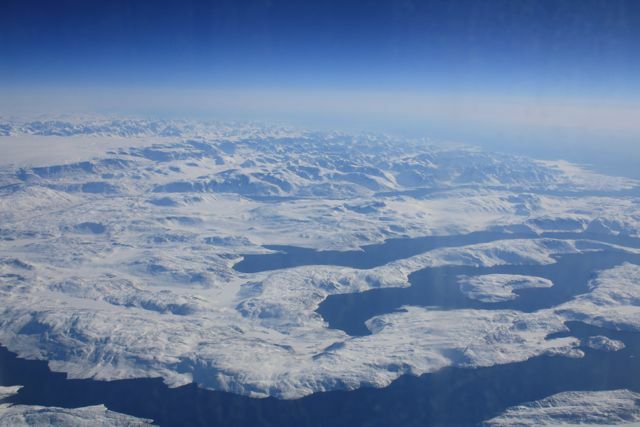 A fantastic view of Greenland from 38,000 ft.
Just one final blog post before I set off from Heathrow to LA. The fund for St Benedict's Hospice and The Children's Foundation has now burst through the £29,000 barrier and currently stands at £29,386.54. That's almost 50,000 in US Dollars. Thanks to George Caulkin from The Times, Simon Pryde from BBC Newcastle and Mark Douglas from The Sunday Sun and Andy Hudson for their donations within the last hour. My airline of choice to and from the USA is British Airways. I've got to give them a lot of thanks for two amazing things today. Firstly, for access to the Business Class Lounge in Terminal 5 where I've just had my second helping of Chicken Jalfrezi! Do you ever watch those airline based reality TV shows where they don't let the passengers on board because they've had too much to drink? Well there is a similar danger here at Terminal 5 where, if I don't stop eating, then I'll be denied access for being too heavy! The second thing that I'd like to thank British Airways for is an upgrade to Business Class on the flight to LA. What a nice surprise that was. I'm not sure how it came about or why they thought that some guy in a Run Geordie Run t-shirt deserved an upgrade but it is most welcome. I'm leaving, on a jet plane…..
My cases are packed, the iPod is fully loaded with some quality tunes and I'm raring to get on my way to LA. I set off from Newcastle Airport this morning and will reach LA in the wee small hours of British Summer Time tomorrow morning. It's going to be very tough to say goodbye to Mrs Run Geordie Run and Run Geordie Run Junior this morning. I won't see them again until the 12 August which, at this moment in time, seems like an eternity away. In my opinion, the effect of being separated from my family is the biggest risk to my mental wellbeing on this run. Apart from a few Newcastle matches in Europe, we've hardly spent any time apart. Recently, I've had some good advice from some very brave and knowledgeable folk in our Armed Forces. Obviously, they face this kind of separation on a very regular basis and it is something that I will be taking inspiration and strength from. In other news, I've managed to get a seat with leg room on the flight out to LA. Thank you British Airways! 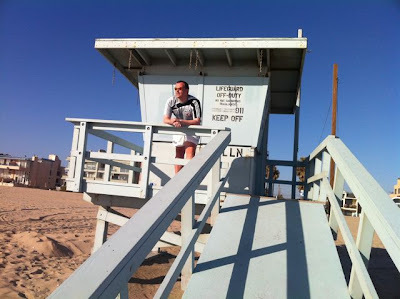 I'll be travelling to LA with the publisher of my book, Stu from Tonto Books. He will be with me for the first 2 weeks of the run and is going to ensure that I continue to write the book in an appropriate style. I'm working to a tight timescale and their is a small window for editing the book when I get back to the UK with a publication date of the 22nd September. I'll be working on the book at the end of each day's running in the USA. No rest for the wicked! 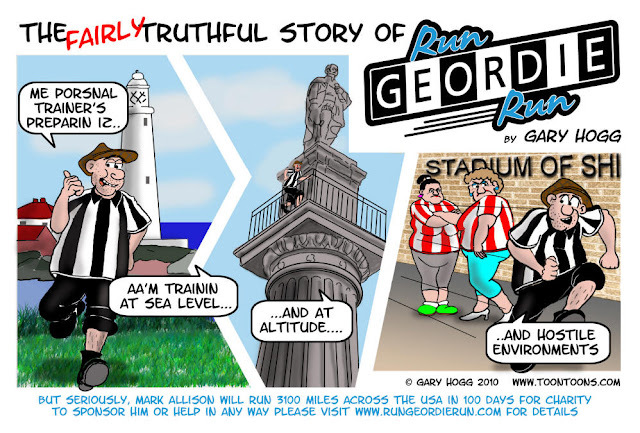 As well as www.rungeordierun.com, you can keep up to date with the run across the USA on Twitter, Facebook, in David Fairlamb's column in The Journal newspaper each Saturday, on www.nufc.com, on BBC Look North from time to time and I'll be giving an update to Gary and Lisa on Real Radio's Breakfast Show every Monday morning. Most importantly, any donations to St Benedict's Hospice and The Children's Foundation can be made using the following links to justgiving.com. All donations are gratefully received, no matter how large or small. Every single pound helps to make a difference to the lives of terminally ill people and children in the region. 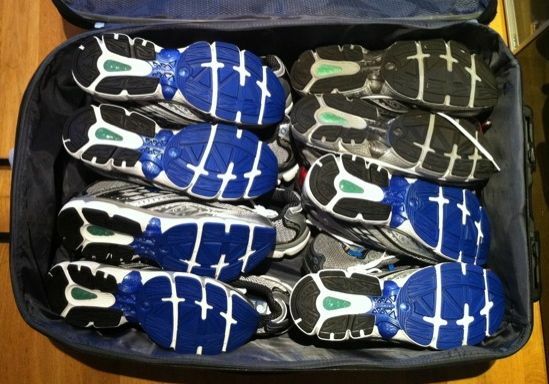 Not much room left in my case after I put my Brooks running shoes in. With that in mind, it is my intention to dedicate 3000 miles of the run from California to New York to the memory of lost loved ones. These people will be in my thoughts as I run each mile and I will most certainly hope to draw on the dedications left for inspiration as well as running in their memory. At the start of each day, in the USA, I will publish on this website who I'm running in memory of. I will also include a photo and the dedication in a series of short video clips. The first of which can be viewed below. It was great to catch up with my main kit sponsors, Digital Spark, down at their offices this morning. They have been very very supportive to me and, of course, St Benedict's Hospice and The Children's Foundation. Pictured with one of my running tops are Creative Director Gavin Kipling and Strategic Director Michael Bell. While I was there, I got the chance to find out about one of the projects they are currently working on; a handheld device to be used by NHS staff to administer patient care on wards dealing with patients who have suffered a stroke. It was all very impressive indeed and by the sounds of it, will save medical staff a lot of time on the admin side of things, leaving more time to actually look after the patients and their needs. Brilliant! This is just the kind of company that I like to be associated with. 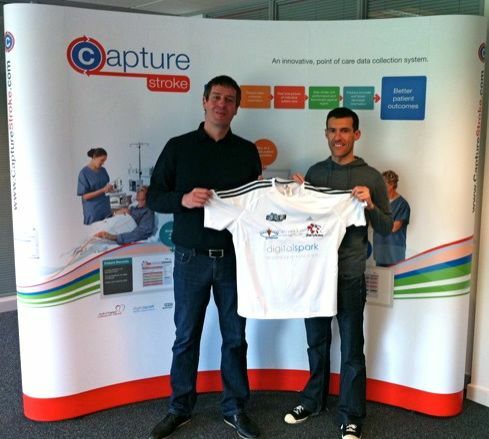 Thanks go to the kind lads at Digital Spark for the sponsorship of my kit. I'll be wearing their logo with pride all across the USA. Thanks to Kim Tserkezie (who played Penny Pocket in Balamory) for this brilliant good luck message. 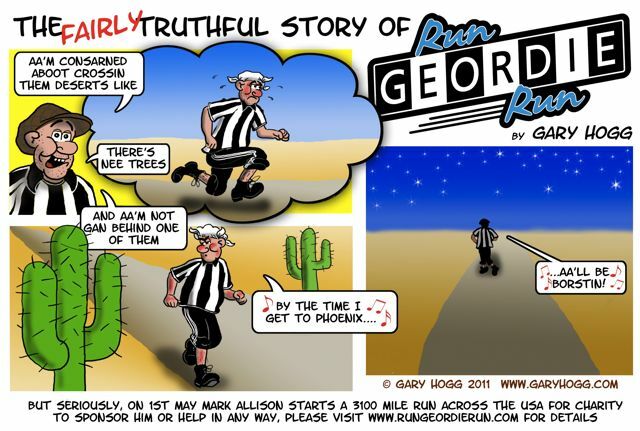 Please send your good luck video messages to sponsorship@rungeordierun.com. Continuing the series of introducing the Run Geordie Run Support Team, it's now time for Steve Harrison. Steve, a Geordie through and through, is one of my colleagues from the Northern Rock IT department and will be driving the "Team Bus" for 2 weeks in July. Steve is a very good motivator and a kind, supporting type of chap. An ideal candidate for the support team. He also makes a cracking bowl of porridge I'm told by his missus. Steve's nickname is "The Cameraman". This is because he has an uncanny nack of getting that perfect picture. And by perfect picture I mean, a cheeky snap of people in unflattering poses. There is a classic one of me tucking into a bacon sandwich. It's simply not fit for publication on this blog. My sponsors would run a mile if they saw it! I'll leave you with a few words from Steve. "I’ve known Mark for a few years but got to know him more since he joined the Men of Steel bike tour in 2009. 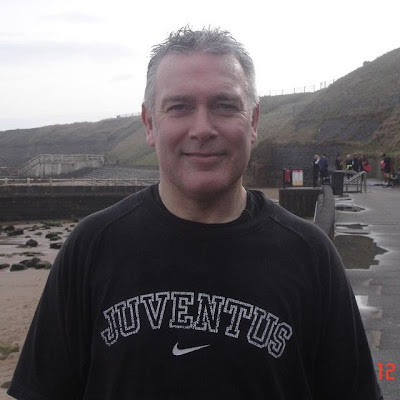 He was part of the Coast to Coast bike ride in 2010 where he managed to break his ankle with the finish line in sight, although typical of Mark’s positive thinking he managed to turn this round and gain valuable publicity. Through being away doing these rides I met a fiercely determined man the likes of which I’ve never known before, it also gave me the chance to get to know Mark better. If it was anyone else but Mark attempting the run I very much doubt whether I’d be so keen to go, but knowing Mark as I do and his reasons for doing the run I firmly believe that he’ll complete the challenge and have a great experience. I feel extremely honoured to be part of the team supporting Mark in his amazing effort to run across America in 100 days and raise £50,000 for The Children’s Foundation and St Benedict’s Hospice. I’m looking forward to it even more as Mark will celebrate his 40th birthday while I’m there. Overall though I’m looking forward to flying out to America, doing some shopping, taking in the sights and having 2 weeks in the sun. I’m also available to do some driving if required!" 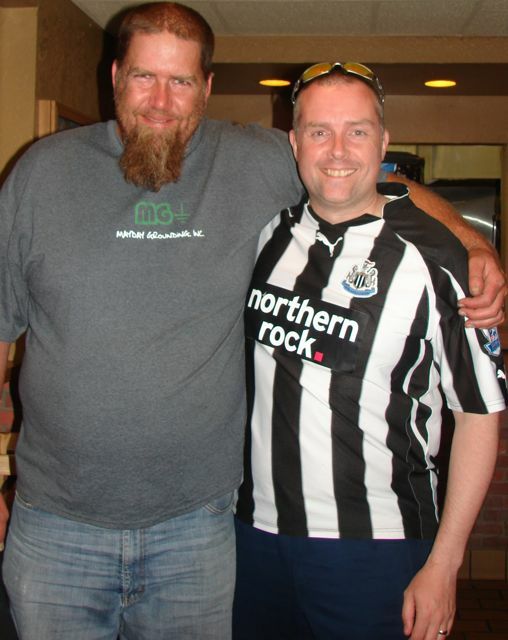 "I’ve known Mark since he managed to get invited on the Men of Steel bike tour in 2009. He was part of the Coast to Coast bike ride in 2010 where he managed to break his ankle with the finish line in sight, thereby ruining the whole event. After we’d managed to calm him down and stop the whimpering we got him off to hospital and the ‘real’ Men of Steel completed the ride. We all felt the ride was a big let down, which was made worse by Mark seeking as much publicity as possible all for breaking a leg. He even managed to get himself on the front page of the Journal, laughing in his hospital bed while the rest of us were back at work, without a mention…but that’s Mark. I feel extremely apprehensive about being part of the team supporting Mark in his crazy effort to run across America in 100 days, I only hope I’m not alone with him as I’ve witnessed previously how he enjoys his vaseline applications. Luckily, I’ve only ever been an observer. It was one moment of weakness, the next thing I know I’ve joined up to go…a warning to everyone of the affects of alcohol. It’s also his 40th birthday while I’m there, but doubt there’ll but any celebrating as he’ll be complaining about being tired. I can’t wait to go!" Saturday morning was the last big day of training for me before I set off for LA on Tuesday. It was a fabulous morning for exercise yesterday and things got off to a great start with David Fairlamb's Beach Bootcamp down at Longsands, Tynemouth. During the warmup, Dave told the 50 participants all about my up and coming run across the USA. The highlight of the session, for me, was running up the ramp from the beach to the promenade. 3 times! At the end of the session, Dave gave an emotional farewell speech. I think, as my mentor, Dave is living this run just as much as I am. I do know that he loses sleep thinking about the distance and the logistics. He gave the ultimate tribute when he said that "In 15 years of personal training, I have never met anyone so mentally tough as Mark Allison". Well I've got to say that it is with the help of Dave and Personal Trainer, Mark Fleming that that is the case. I was really pleased to meet one of Dave's new Personal Trainers, none other than Great Britain's medal winning swimmer Chris Cook (pictured below). Chris took gold in the 50 and 100 metre Breaststroke in the Commonwealth games in Melbourne in 2006. He also represented Great Britain in the 2004 and 2008 Olympic Games! It was such an inspiring honour to meet an Olympian and all round nice guy to boot! 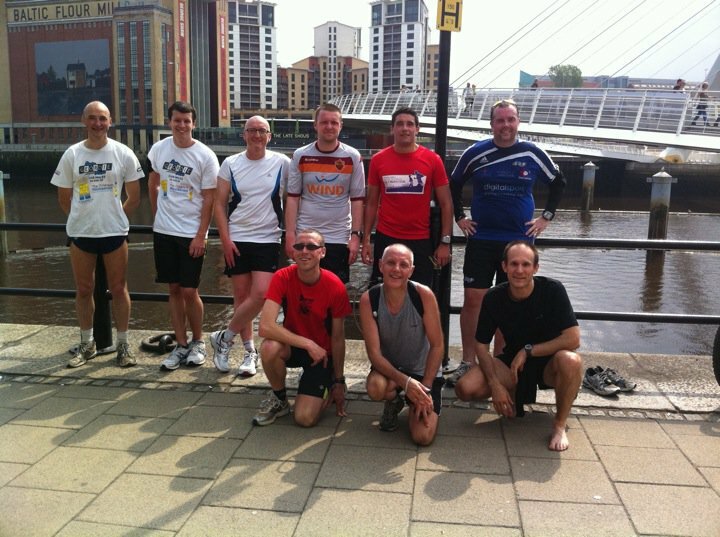 Once Beach Bootcamp was finished it was time to head to The Millennium Bridge for a final crack at the Peter's Pies 6 Tyne Bridges Challenge. There was a good turnout of 9 runners (and later on 2 cyclists) and it was a fitting send off in glorious sunshine. In time honoured tradition, of course, I finished dead last. I was grateful to the lads for stopping every now and again for me to catch up. They were a fit bunch! I now have a couple of days to spend with Katy (Mrs Run Geordie Run) and Jack (Run Geordie Run Junior) before setting off to LA on Tuesday morning. To say that I'm eager to get the run across the USA underway is an absolute understatement! I've been happy for a few months that my head is in the right place. I couldn't possibly be any better mentally prepared than I am at this moment in time. Physically, I could be in much better shape. I'm carrying a lot of weight but this will sort itself out in the USA and them some! Thanks to everyone who has made a donation this week. The current total is £28,376.70. This is fantastic news for St Benedict's Hospice and The Children's Foundation. 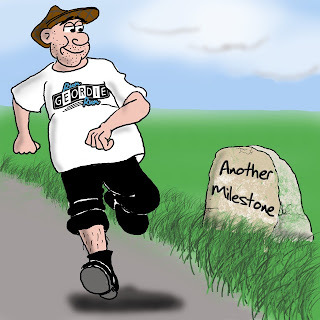 If you would like to sponsor my 3100 mile run across the USA then please use the following links. The good thing about using the justgiving website is that your donation is made securely and goes direct to the 2 charities; St Benedict's Hospice (Charity No. 1019410) and The Children's Foundation (Charity No. 1000013). 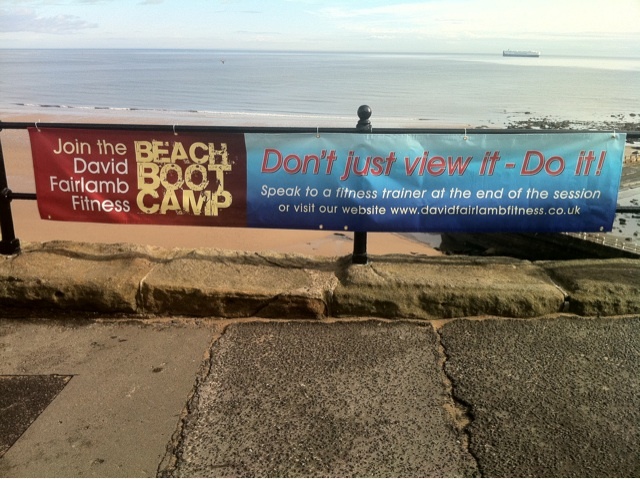 Who is up for a bit of Beach Bootcamp on Longsands opposite the Grand Hotel in Tynemouth? It starts at 9. See you there? Then it's off to do my final 10.5 mile Peter's Pies 6 Tyne Bridges Challenge starting at the Newcastle side of the Millennium Bridge at 11. All welcome. It will be a nice casual pace. See you there? I'll be live on Real Radio again this morning from 9 am (BST). I'll be joining Breakfast Show presenter Gary Philipson on a 7 ish mile run from Hollywood Avenue to the New York Diner in Team Valley Trading Estate. Please tune in to 100 - 102 fm or listen online at www.realradionortheast.co.uk. I took to my seat 45 minutes before tonight's kick off against Manchester United. It gave me some time to take in the atmosphere and also time to reflect on the task ahead starting in just 12 days time. It ended up being an emotional farewell to St James' Park and the Toon Army. I suddenly realised that, in fact, it would be the first of many goodbyes I'll be making over the next 7 days. 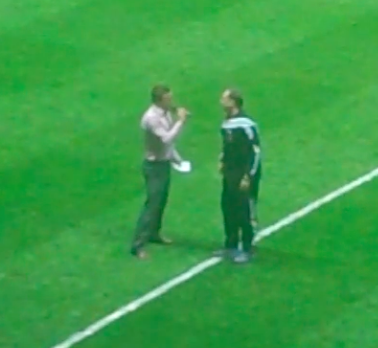 I was delighted to make a half time appearance on the pitch where I had a quick Q&A with match host Justin Lockwood. It was a great chance to raise the profile of the run and once again state just how credible this challenge to run across the USA actually is. I was very pleased with the reception from the stands. I was told later that, as well as the Toon Army, the Manchester United fans were applauding me too. Which was nice. I also said farewell this evening to one of my biggest supporters, Biffa from nufc.com. Biffa, who sits near me at the match, has backed me time and time again over the last 10 years and the publicity that is afforded to me and the charities has made a massive difference to my fundraising efforts. Avoiding defeat against the league leaders was pretty good icing on the cake and a very good send off for me personally. I'm really disappointed to be missing the final 2 home games of the season but at least I'll be back for the start of the new season in August. Actually, I hope to attend a match prior to that and I'm aiming to be in Columbus, Ohio on July 26th as Newcastle take on Columbus Crew. All in all it was a good evening's PR work on the back of last night's appearance on BBC Total Sport. If that wasn't enough, then I've written a "10 things to do before you die" article for this month's Living North Magazine and a "Now and Then" article will appear in this Saturday's Journal newspaper. 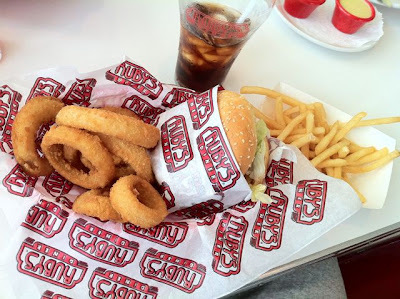 Of course, there is also the small matter of running from Hollywood Avenue to the New York Diner burger van in Team Valley live on Real Radio on Friday. I've just got the small matter of my final 2 runs in the Environmental Chamber at Northumbria University over the next 2 days. I've had 6 good sessions recently at temperatures of up to 39 Degrees Celsius and 11,000 ft simulated altitude. The last run I did, last Sunday, was the best with 8.5 miles done at 32 Degrees Celsius. I'm going to try and better that tomorrow and on Thursday I've got a fitness test at 37 Degrees Celsius. Exciting times ahead! Tomorrow night from 7 I'll be live on the radio on BBC Newcastle's Total Sport show. The show is hosted by Simon Pryde (who ran the London Marathon today incidentally) with ex Newcastle defender John Anderson and ex Sunderland striker Marco Gabbiadini in attendance. I've been on the show on a number of occasions in the past but this time I'll be in the studio. Please tune in if you can. You can even listen online at www.bbc.co.uk/tyne. If Shola scores I'm on the pitch! 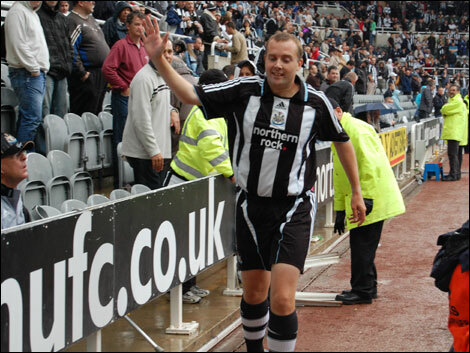 After I finished running from John O'Groats to Lands End in 2007, Newcastle United bestowed on me a lap of honour at St James' Park. I described that short run around the pitch as "like the best dream I ever had" and "one of the proudest 10 minutes of my life". This is how I summed that particular day up back in 2007. "I mentioned to the lads in the pub after the match that I fully expected to wake up this morning at 18 stone again and having had the most amazing whirlwind of a dream. The dream went something like this. 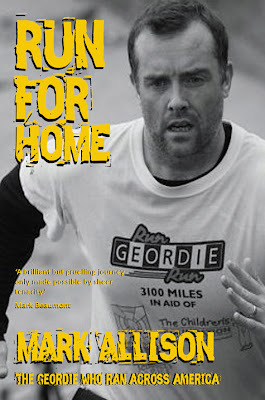 I ran 874 miles down the length of the country, amassed over £25,000 in sponsorship for the Hospice and got to run an unprecedented lap of honour round the pitch at St James' Park. You couldn't make it up! Anyway, I spent the entire first half yesterday in a very very nervous mood. And believe you me, I don't get nervous easily. I was so nervous that I had my first ever toilet visit during open play. Not bad considering that I've been going to the match for 22 years. At half time, after getting changed in the media suite, I made my way to the opening of the tunnel. To get rid of the nerves I imagined that I had 2 rows of teams behind me and a captains armband on. The announcer said his piece and it was time to walk out onto the side of the pitch. This time, I imagined that I was the latest new signing being unveiled to the crowd. What an impact this had and I don't think the smile on my face left me for a good few hours. As I walked onto the pitch side, I expected a few polite applause here and there around the ground so the actual reception that I got was amazing. It seemed to me that the whole crowd was applauding. Local hero played over the PA system and I set off towards the Gallowgate end. I later found out that it was raining heavily as I ran. This was news to me as I didn't feel a drop. I can't remember running either. I just seemed to float around. The applause and cheers never stopped as I ran (floated!) around the pitch side. Their were real looks of admiration and pride on the faces of my fellow supporters. I seemed to keep my arm aloft all the way around, while waving and cheering every now and again. All the while the smile on my face seemed to grow wider and wider. I shook the hands of a lot of people and there was a load of high fives in there too. Now the surreal bit. I signed a couple of autographs at the Gallowgate End and some in the East Stand. Then, at the Leazes End, one lad who I'd had a supportive email from while on the run asked if I would sign his programme. Now I'd planted the other autograph hunters in the crowd. This one was genuine! GET IN!!!! I've signed my first autograph. I made my way to the Leazes/Milburn corner and caught sight of my son Jack in the crowd. I gave him a quick hug before arriving back at the tunnel. At this point my grin was at it's maximum span! I later got a text message from an occupant of the East Stand saying that "You looked chuffed!.". That was a bit of an understatement! At the tunnel entrance, Chairman Chris Mort was waiting to greet me with a Toon shirt. 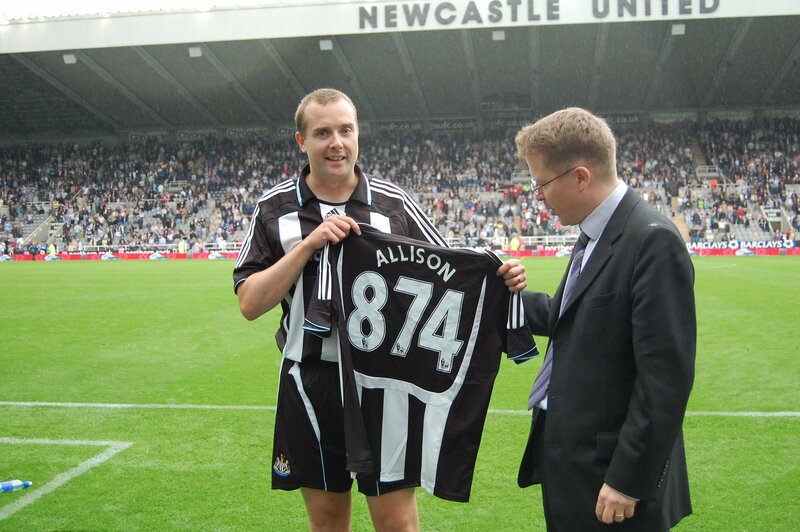 The shirt had the number 874 and name Allison. It was also signed by the first team! I had a few words with Chris who seemed like a smashing bloke by the way. He presented me with the shirt and we posed for photos. I then held the shirt up to the crowd and more applause rained down. Amazing! 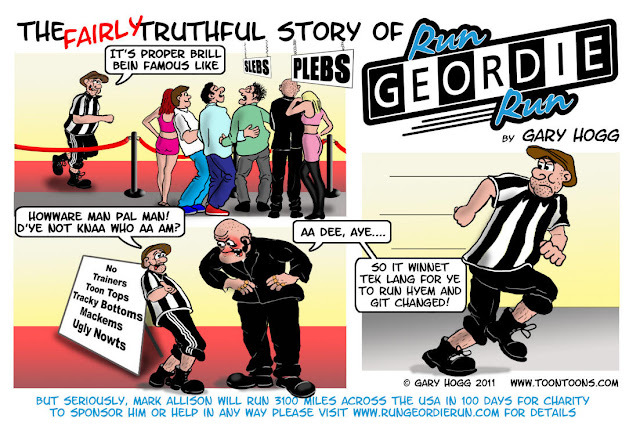 Little did I realise but another life long ambition was soon to be realised as I got asked to draw the Geordie Jackpot! As I said before "You couldn't make it up!". To top things off even more, I went "back stage" to get changed and met Supermac. He was full of praise for my efforts. All in all this was a great day! Later on, I relived the half time lap over a few beers and a curry with the lads. I would never have dared imagine today's events would be possible when I set off from John O'Groats on July 7th amidst severe wind and rain. And I swear that my grin just got wider and wider as the night went on!". 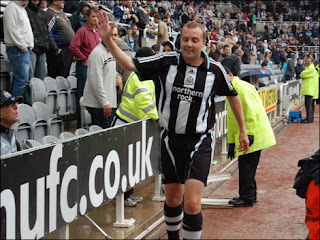 Unlike the lap of honour in 2007, I will be seeing Tuesday's appearance as a "farewell" and "good luck". It's by no means a "well done" or "congratulations". There are lots of miles to be run and lots of funds to be raised before those messages can be received. nufc.com had the following to say about Tuesday's half time appearance. "Watch out for a special half time guest on the pitch, as Mark Allison aka Run Geordie Run bows out of SJP for the season. His coast to coast USA charity run begins on May 1st, meaning he'll miss the final two home games. Give him a cheer, give him a few bob and have a look at how final preparations for this remarkable feat are proceeding via his website..". If you're at the match on Tuesday please don't forget to wave and cheer at half time! There was some great banter on yesterday's Real Radio Breakfast Show with Gary Phillipson and Lisa Shaw. As well as promoting the run across the USA and the 2 charities, I was able to answer a few questions from the listeners. "How much do you like nappy rash?" and "What are the scariest parts you'll be running through?". I've been asked a lot of questions but never those 2. I'm glad to say that I continued my reputation for always having an answer for everything! I was hoping to issue Gary with a running challenge live on air but he beat me to it and issued his own! And what a challenge! Next Friday we will be running, live on air, from Hollywood to New York. 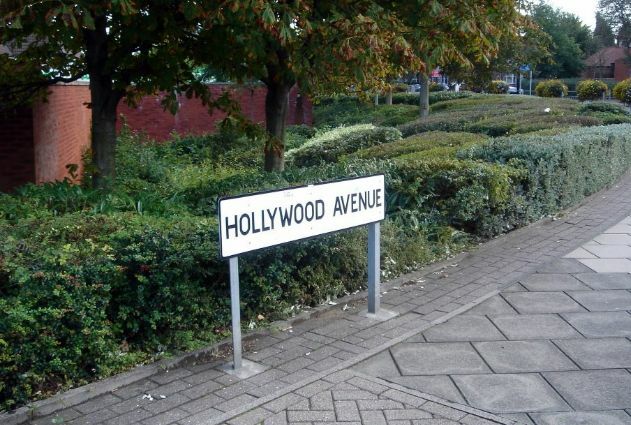 Hollywood Avenue in Gosforth to the New York Diner (pictured) outside of Real Radio on Team Valley that is. Don't forget to tune in for that one. 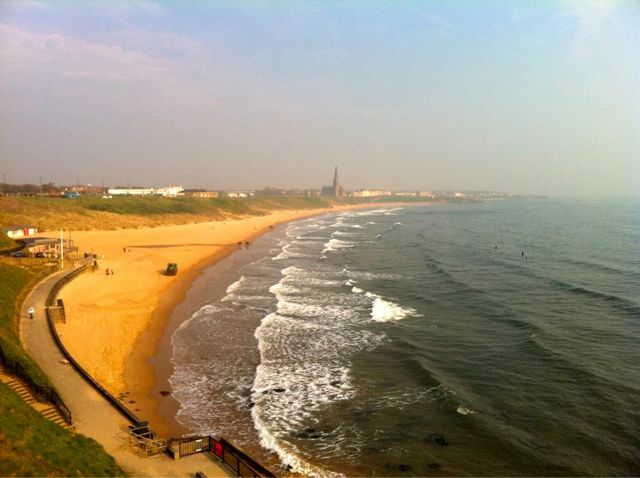 It's 100 - 102 fm in the north east or you can listen online at www.realradionortheast.co.uk. Gary and Lisa had kept a surprise back until the end of my time in the studio. They announced that I would be a guest on the pitch during the half time interval of next Tuesday's match between Newcastle United and Manchester United. Fantastic! I was speechless for a second and then remembered that this was live radio. What I said thereafter is a bit of a blur but it would of been "Thanks" and "Wow"! So there we go; a training run live on Real Radio on Good Friday between 9am and 10am but before that an appearance on the hallowed turf of St James' Park. What a send off that is going to be, the week before I leave for the USA! Thanks to Gary, Lisa and producer Mac for more quality airtime. 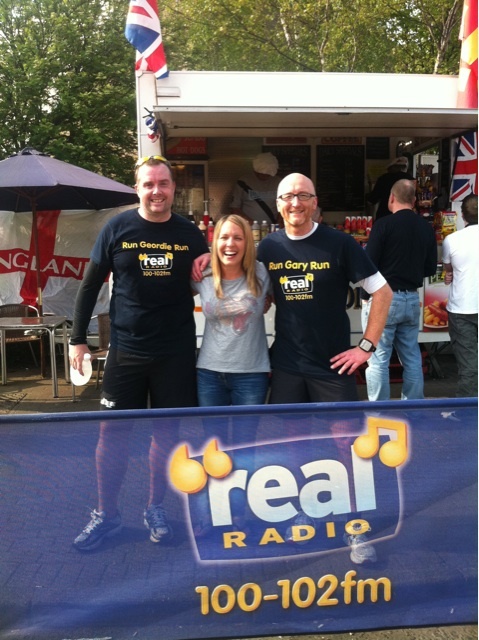 I'll be on the Real Radio Breakfast Show with Gary Philipson and Lisa Shaw on Friday morning between 0730 and 0800. The last time I was on the show I challenged Gary to join me on the last day of the run in the USA. He duly accepted and will be running with me for 20 or so miles right through Manhattan to the finish line in Coney Island. He soon earned the nickname Gary Gump! During tomorrow's show I hope to get an update on how well Gary's training has gone so far and to issue him with yet another challenge. You can listen live in the North East on 100 - 102 fm or online at www.realradionortheast.co.uk. 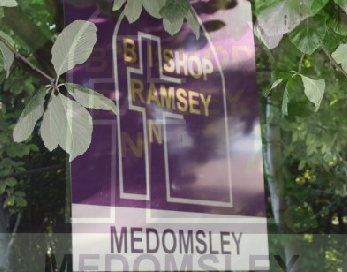 The staff, pupils and parents at Bishop Ian Ramsey School in Medomsley, County Durham have been very busy raising funds for the 2 charities during the last school term. A non-uniform day was the first event to be held and raised £168. Next up was a cake and bun stall which raised £110. I was fortunate enough to taste some of the wares. Delicious! Finally, an Easter Egg raffle was held where parents were asked to donate prizes. A lot of Easter Eggs were donated and I think the pupils stood a more than excellent chance of winning one. This event raised £149.38 giving a grand total raised of £427.38. Brilliant! I understand that the school are going to track my progress across the USA and I hope to send a thank you message to them from the Rocky Mountains in June. In the meantime, thanks go to Headmaster Mr Boyle, the staff, pupils and parents for a super fundraising effort. I put a request in for the kit that I'll be using in the USA with Brooks earlier this week. It was like Christmas today at Run Geordie Run HQ as a huge box of running shoes and kit were delivered. Those are the trainers pictured below and I also got various t-shirts, pairs of socks and my favourite Equilibrium base layers. 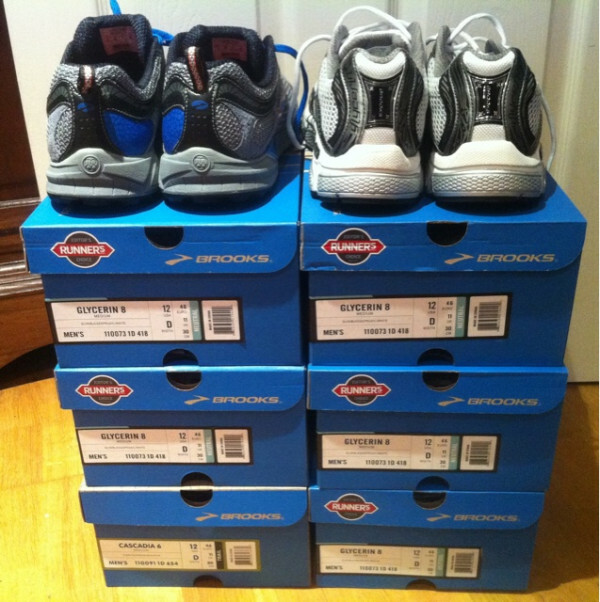 Thanks once again to Brooks for your support. This kit will be put to very good use across the USA. My running and presentation kit went to the printers today to have all sponsors logos embroidered. I had almost given up hope of securing the fourth and final sponsor spot. Just in the nick of time, however, CherryActive took that spot and their logo will be seen on my kit as I run across the USA. I've had phenomenal success with the CherryActive product since trialling it last month. The staff at Northumbria University recommended it to me originally and it has now become an essential part of my recovery strategy. Regular readers will remember how I first used the product after a 32 mile run from Alston through the North Pennines to Shotley Bridge. I couldn't quite believe just how good and acid free my legs felt the following day. The same results were seen the following week as I ran 106 miles from Edinburgh to Newcastle over 3 days. Since then, I have been writing about the product on my blog, Facebook and Twitter. It seems I'm not alone in my observations as some readers and followers have taken time to get in touch and report similar findings with CherryActive. There is a whole host of info on the CherryActive product at www.cherryactive.co.uk. 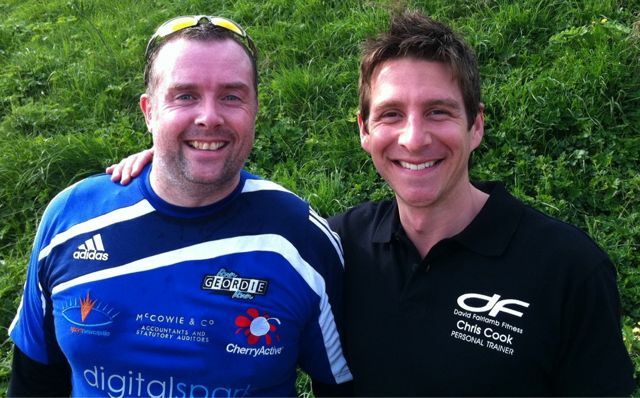 CherryActive join Sport Newcastle, McCowie and Co and Digital Spark as kit sponsors. 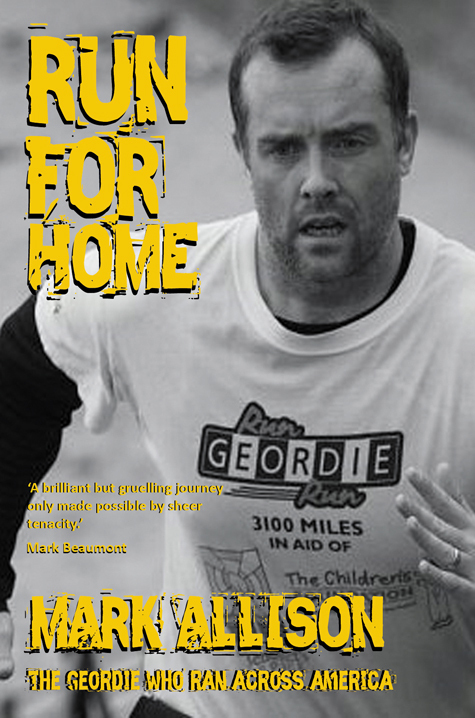 I'm pleased and very proud actually, to announce that a third local organisation has become a kit sponsor of Run Geordie Run. St Benedict's Hospice and The Children's Foundation will benefit from this sponsorship deal. I'm extremely grateful for Sport Newcastle's support. I've been aware of the work that the organisation do for some time now. They recently held their annual sports awards dinner where Kevin Nolan was named North East Sports Personality of The Year. Here is a brief summary of the organisation. "Sport Newcastle are a voluntary organisation that have been working in Newcastle for over forty years. Their aim is to encourage the development of sport in the City by offering funding opportunities to men, women and children seeking to realise their sporting dream. Whether backing community projects or local clubs, elite international athletes or individuals of regional repute, we try to promote success through sport. All of their funding is generated through sponsorship and events, the main fundraiser is the Sport Newcastle Annual Dinner staged at Newcastle’s Civic Centre in March each year. This event is attended by the city’s sporting heroes past, present and future and culminating in the presentation of the prestigious Sports Personality of the Year award. Some of the biggest names in North East sport have received the award over the years including Jonny Wilkinson, Kevin Keegan, Paul Gascoigne, Glen McCrory and most recently Kevin Nolan. They currently operate a Sports Scholarship scheme in partnership with local companies and individuals which allows eleven talented local athletes receive sponsorship to help them achieve their sporting ambitions. These include Olympic hopeful athletes Ryan McLeod and Lauren Dewdney, Swimmer Jessica Thielman, Gymnast Grace Imeson, Judo Player Louise Little and Basketball Player and Newcastle Eagle Ross Wilson. In addition to the scholarship scheme individual grant applications are considered four times a year by a committee of Trustees." Sport Newcastle join McCowie and Co and Digital Spark as sponsors of my kit. My kit is on the way to the printers this morning to have logos applied. There is an outside chance that the final kit sponsor's place could be filled today but the printing deadline looms. 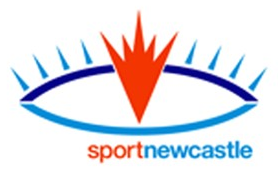 Thanks to Sport Newcastle for their valuable support. I recently gave an interview to Radio Teesdale. You can listen to it here. 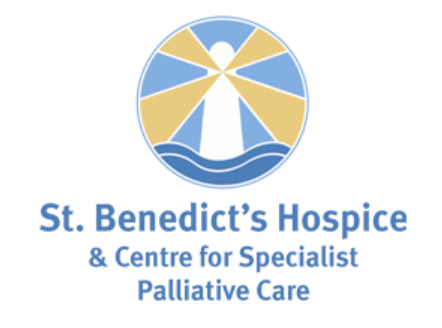 The charity fund for St Benedict's Hospice and The Children's Foundation passed the 27k barrier last week and currently stands at 27,124.33. There was a steady stream of pledges and continued donations from Sara Sarginson, Dianne Pringle and Karen Mason were made too. These 2 very generous ladies have been making a monthly contribution to the charities for quite a while now and their support is very much appreciated. Thank you Sara and Karen and, of course, everyone else who has made a donation. Bishop Ian Ramsey School in Medomsley held a cake and bun stall and raised £110. They are holding an Easter Egg raffle this week to bring their fund raising to a close. I look forward to writing about their total donation very soon. Thank you to Headmaster Mr Boyle, the teachers, pupils and parents for their generosity over the last term. A short and sweet good luck message from Tom Hingley, the singer from the Insprial Carpets. 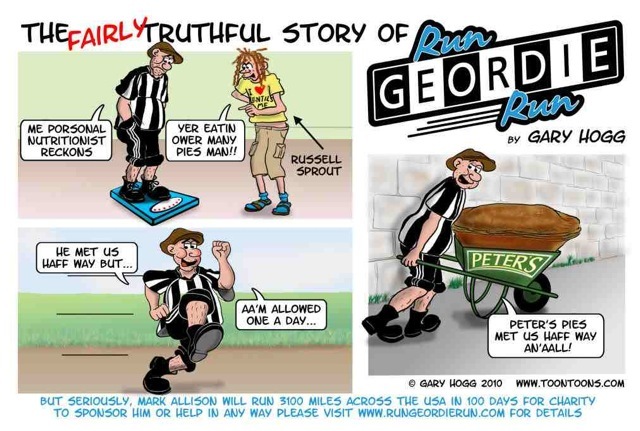 Please email your Good Luck video messages to sponsorship@rungeordierun.com or upload them using YouTube. 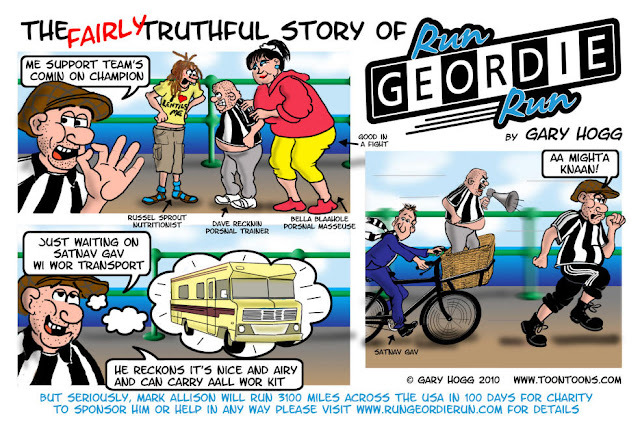 Next up in the continuing series of introducing the Run Geordie Run Support Team is Sports Therapist Kirsty Reid. 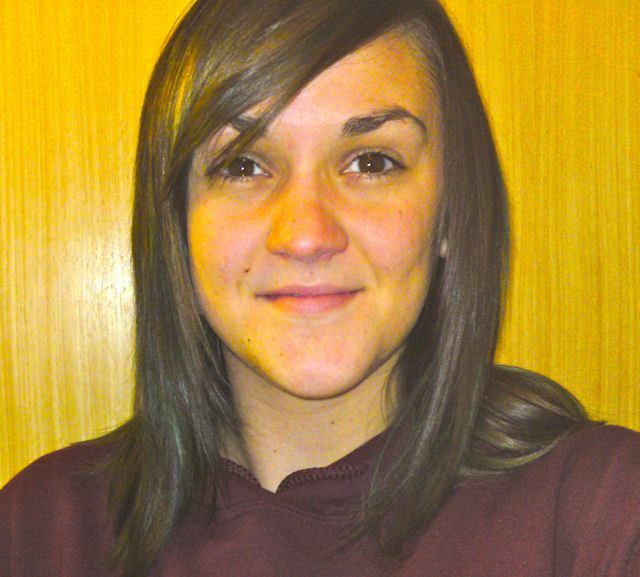 Kirsy, from Erskine near Glasgow in Scotland has a degree in Sports Therapy. Coincidentally, my John O'Groats to Lands End Support Team back in 2007 also had someone from Erskine in it. The one and only Owen McMahon (aka Rab C Nesbitt). Unlike Rab, though, Kirsty follows the blue half of Glasgow. Kirsty is the youngest member of the team at 22 and will join the tour on day 15 just 2 days after Las Vegas. I should be in quite a state by that point having run almost 450 miles during the previous 2 weeks. It'll be Kirstie's job to ensure that I'm all repaired and ready to face each day. Kirsty is with the team for 4 weeks and will see me right through the Rocky Mountains. By the time she leaves, I should be in pretty good shape physically and hopefully won't need as much fixing and repairing afterwards. It's great to have Kirsty as part of the team for such a great length of time. As I'm giving all of the team nicknames, she'll be known as 'Wee Kirsty' from now on. "Hi I'm Kirsty and I will be joining Mark two weeks in to his amazing challenge. My role in the support team is Sports Therapist and to make sure Mark can complete the run in one piece! I am really looking forward to the challenge and very proud to support Mark in one hell of a run! Not only will I get some valuable experience but I will be travelling between Las Vegas and Idaho Springs and get to see some great sights! Lets go team :)".